CM: Dorothy Gray's Hormel Onion Soup Makeup Case was a gift to Irene Rich from Arthur H. Sulzberger, editor of the New York Times. A 14 page letter Irene wrote to her daughter Frances Rich, on stationary from the Waldorf Astoria hotel in New York, verify their affair and bring to our attention the inscription "Fun? Fun!" incised near the hallmark. Fran was living in Paris France at the time with the postmark date on the envelope being 1 September 1934. 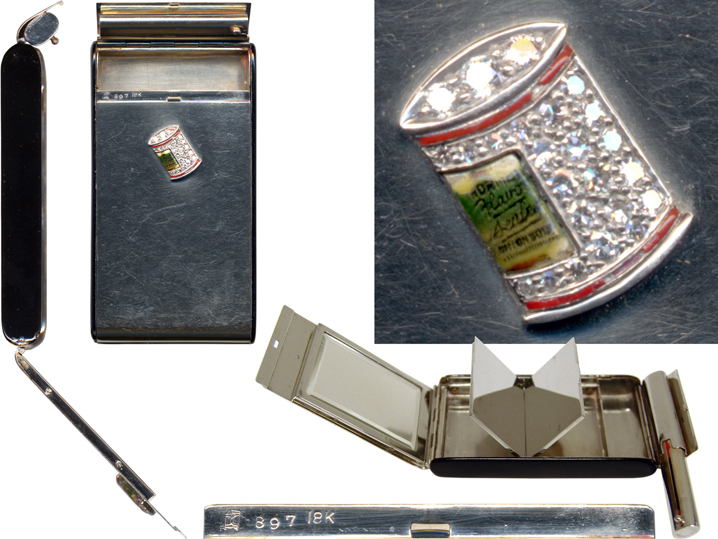 On page 8 of the letter Irene draws a picture of the compact describing it's features such as the platnium case, diamond studded soup can, black and red enamel accents etc. Pages 6 to 9 explain the gift from Arthur Sulzberger. "- he has been so cute knowing that I powder my nose and paint my lips more often than any other one thing during the day he has given me all kinds of things with which to perform those duties - one lovely English wood powder thing with silver [...]? I wasn't too keen about so I pretended I had lost it - it was so big to carry - what did he do but buy me another - but alas the sweetest thing - I told you how the can of Hormel's Onion Soup had played such an amusing part in our fun - even to calling ourselves “Mr. and Mrs. O.S. Hormel„ - and the dog “Little Hormel„ etc. etc. - and all his cards with flowers - which have been plentiful had that little [soup can] on as only he can draw it. Well sir - he brought me the other night a perfectly lovely compact just this size - [drawing] - it doesn't look well I've made the can too big, but it is the sweetest darn thing and no end of work he went to to have the thing done - inside when you open the part the powder is engraved Fun? And the other is Fun! That is what we have always said you see one of us Fun? then the other Fun! - and so it ends -" [kindly transcribed from the original letters by Joni Marshall, caretaker of Frances Rich]. Hormel's label is meticulously painted with enamel to read clearly "HORMEL / Flavor / [?] / ONION SOUP", while the metal glitter of its body is evoked by a group of twenty-four diamonds. Such popular imagery combined with such ostentatious materials is outstanding, especially in the knowledge of predating Andy Warhol's legendary Campbell's Soup Cans (1962). Owing to its great value, Dorothy Gray's Hormel Onion Soup Makeup Case was greatfully received personally by ACG President John S. Baley directly from Mr. and Mrs. Robert Allen, executors of The Frances Rich Estate, during their visit to the College on 28 February 2008.